A warm welcome to St. John’s Church in the beautiful village of Churt in Surrey. We hope you will find our website interesting and helpful. The best way to find out about St. John’s is to come along to a Sunday service or to another of the activities we offer. Whether you have been a Christian for many years or are just beginning to wonder whether God has any relevance to your life, you will find a warm welcome, a place to ask questions and make new friends. We have a wide range of activities, providing various ways for everyone to engage in the life of the church. The church is open every day and you are welcome to come in, whether it’s to explore the building, find a quiet place to pray, or to visit our resources area. 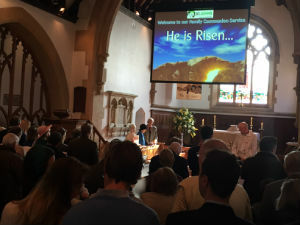 We are part of the Joint Benefice of Churt and Hindhead, and work closely with our sister church St. Alban’s in Hindhead.